Learn the different types of mosaic tiles, glues and substrates and how to work with them. The first project will be a 12 x 12 mosaic. For your convenience I will have a 12 x 12 stepping stone or a 12 x12 base suitable to hanging on an inside or outside and vitreous glass tiles available for a material fee of $20. I encourage creativity in my classes and students are welcome to bring own projects and supplies and are not required to buy materials from me. But you will need to bring your own eye protection and gloves. The second project is your choice and you will need to purchase all the supplies and tools for you second project. I have a supply list, project ideas and design guidelines you can download below you can also look at ideas on Pinterest, in books or other internet sites. Inexpensive dishes can be purchased at thrift shops and tiles are available through internet stores. I have tools for you to use in class, but if you have a large project and want to work at home you will need your own offset tile nippers for working with ceramic or wheeled nippers for glass. 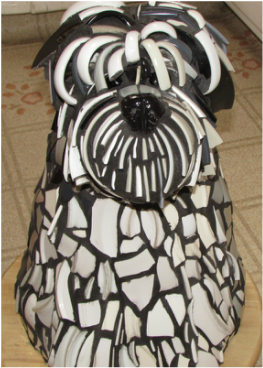 The first project is provided and is a flowerpot using broken dishes you will shape and apply the tiles. The pot, ceramic dishes, adhesive and grout for this first project will be provided, the only things need to bring you for the first class is your own eye protection and gloves. In the first class broken china will be adhered to the pot and we will discuss your second project focusing on materials and the techniques that will be used to design and create your own project. 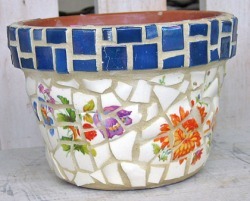 The second class will be starting your own project after grouting the flower pot which only takes about an hour. You will need to purchase all the supplies for you second project Your second project can be anything you wish, look for ideas on Pinterest, in books or other internet sites. Inexpensive dishes can be purchased at thrift shops and mosaic supplies are very inexpensive through internet mosaic stores. You can choose to continue on with broken dishes or switch to tiles. If you have a large project and want to work at home you will need your own tools. The tools you need are only about $16.00 and are available at local hardware stores or on line. This class is for students who are serious about creating special projects they want to make would like guidance and help. Students should have some experience and know what they would like to make as well as tools and supplies. Your project can be any object you can carry and can be mosaiced with mosaic tiles, glass, ceramic, or broken dishes. Supplies are not included, you will need to bring all your own eye protection, gloves, adhesives, tiles, grout, sealer, and object to mosaic. I have tools for you to use in class, if you have a large project and want to work at home you will need your own tools. 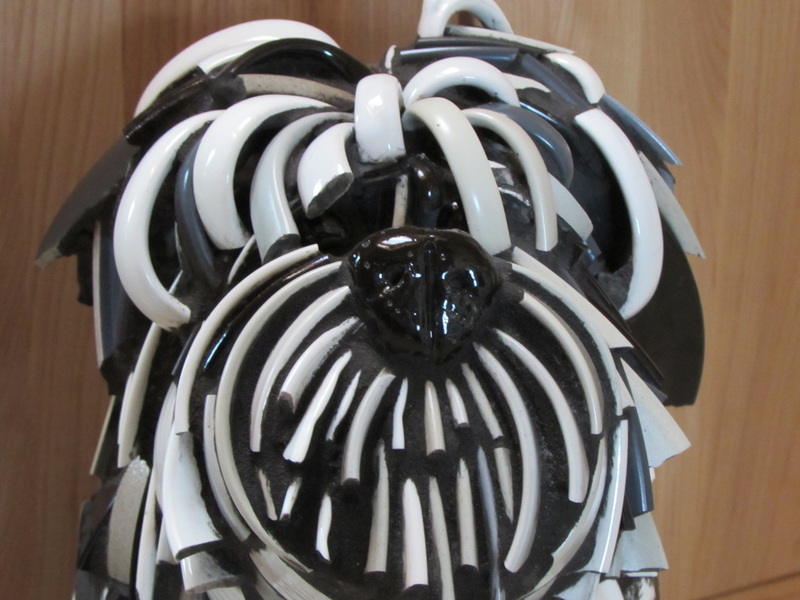 Dog sculpture - clay pots and broken dishes and cups. A great class for the first-time mosaic artists. Learn the basics of mosaic art by applying mosaic tiles to this pre-cut MDF shape. This is a two-day class with a total of 4 hours, on the first day you will design and glue the glass pieces to the form the second day you will apply the grout to seal the surface. Price includes instruction and materials. First Day 3 hours design and glue the glass pieces to the form second day 1 hour to apply the grout. Mosaic classes except are at my home studio on Peralta Blvd. in Fremont. To register for classes please email me at susan@susanbettencourt.com to let me know which class you wish to enroll in and I will reserve a space for you. Class space is limited so once you have arranged a time I will send the supply list. You can pay by credit card, cash or check the first day of class and bring it the first day of class. Build simple garden sculpture using cement and a combination of molds then cover it with mosaic. Create mushrooms small or large whatever shape you want using a combination of molds. First class is all about making the cement mushroom; we start by choosing a casting mold for the top mushroom cap and one for the bottom mushroom stem. After molds are chosen we prep the molds, mix the cement and pour the cement into the molds. We will also start cutting the mosaic pieces to be used in the following class. If you are using a pattern or a design on your mushroom it can be arranged at this time too. The second class is applying the mosaic pieces to the cement form and the third class is grouting the mosaic. Three class workshop for making a stepping stone by cement poured over glass decoration. The first class is two hours bring your own glass I will show you how to cut and break into shapes to create your design I have the paper to work out your design. Second class should take about one and a half hours and is all about prepping the mold and mixing the cement I have 12 inch round and square molds paper to work out your design and the cement for pouring it in the mold. The third class is a short one just cleaning the glass and filling in any air pockets. 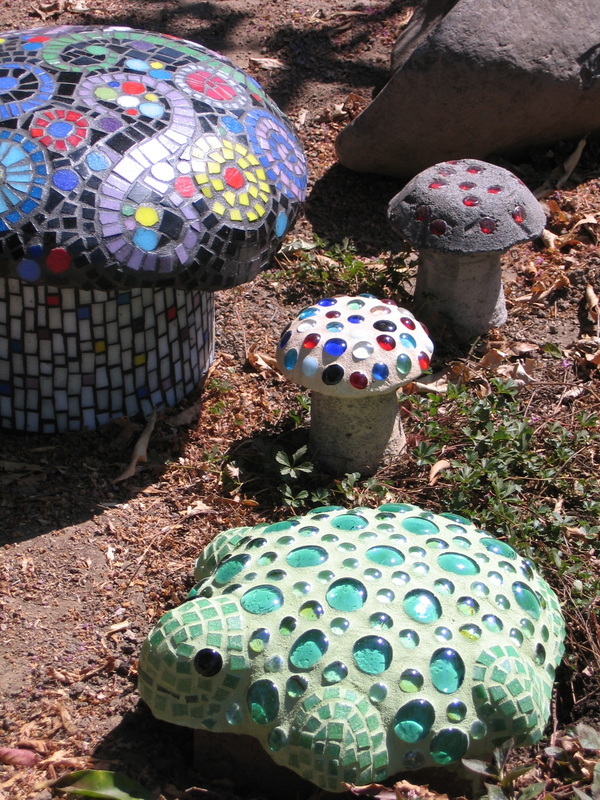 Toadstools and mushrooms and other cement sculptures. 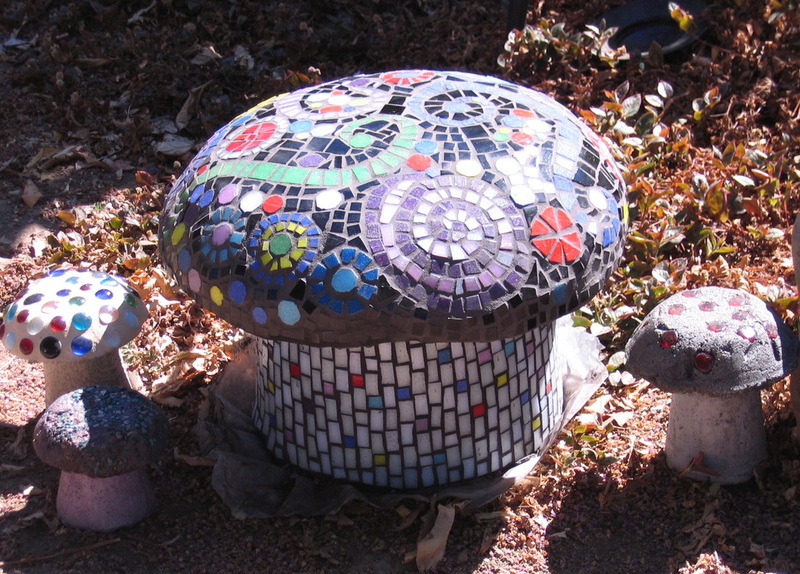 The large toadstool is mosaic applied over cement. In this is a one day workshop for advanced students only for mixing cement and pouring to create concrete stepping stones or sculpture. For some projects we will be pouring cement over mosaic and for some the mosaic will be applied after the cement is finished. Students will need to provide own mosaic tiles or glass I will provide cement and students are welcome to use any of the molds I have or bring your own. For me to set up molds, and cement you must RSVP for this workshop so I can discuss the materials list. Depending on the size and scope of your project you may be able to finish your project in one class other projects may take longer. The cost of the workshop is $25. per day. Email or call Susan for dates.